The red plum’s presence confounds the third grader. She didn’t want the fruit in the first place, yet there it is. She doesn’t want to eat it, but she knows that tossing it into the garbage at Oakland’s Hoover Elementary School is wrong. Standing before containers for trash, recyclables, compostables, and unopened entrees, milk cartons, and whole fruit, the girl’s decision-making matches her Disney-movie hijab — Frozen. For decades, students here and there have made use of designated tables in school lunch rooms to leave or pick up unwanted whole fruit, packaged foods, or other meal items. Although rare in most school districts, Deming has standardized the practice and made it mandatory for schools serving some 37,000 students in Oakland. 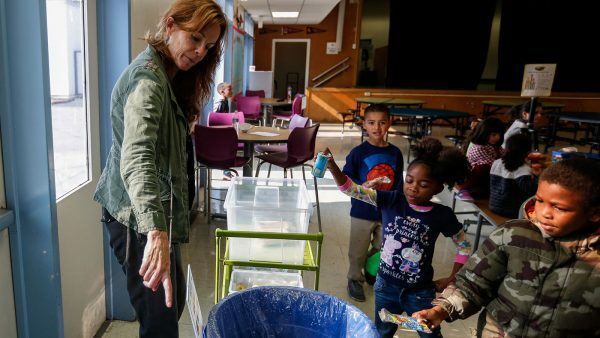 As the only school employee in the country whose sole responsibility is fighting food waste, Deming has transformed the Oakland Unified School District — and somewhat reluctantly herself — into a national leader. With her help, the district has arguably done more than any other in the country to minimize excess food, redistribute edible leftovers to people in need, and compost the inevitable inedibles. No one condones trashing edible food, especially when 12 percent of U.S. households don’t know where their next meal is coming from. And it has serious environmental consequences: Agriculture generates a third of U.S. greenhouse gas emissions, and roughly a fifth of the nation’s pesticide, water, and fertilizer usage goes into growing food that will nourish no one. It’s also a waste of money. Researchers estimate that 40 percent of the American food supply isn’t eaten, a shopping cart worth $218 billion. Schools are a big part of the problem. The USDA’s National School Lunch Program serves 30 million kids every school day, a point of justifiable pride. But the program also wastes about $5 million worth of edible food every school day. That’s $1.2 billion in losses per school year. The price tag is bad enough, but tacitly teaching children that it’s OK to throw out untouched portions of cheese ravioli and chicken tenders may be even worse. Why do schools waste so much? The quality of food can be questionable, given the lack of on-site cooking facilities and minimal USDA funding. And many students end up with food that they don’t want, thanks to a USDA reimbursement requirement that students take lunch items from at least three out of five categories — vegetable, fruit, protein, grains, and milk. At least one of those choices must be a fruit or vegetable. In theory, having food choices reduces waste, but students aren’t allowed to take just one or two items they know they’ll eat. Aiming for the federal government to cover a “reimbursable meal,” staff often push students to take more. 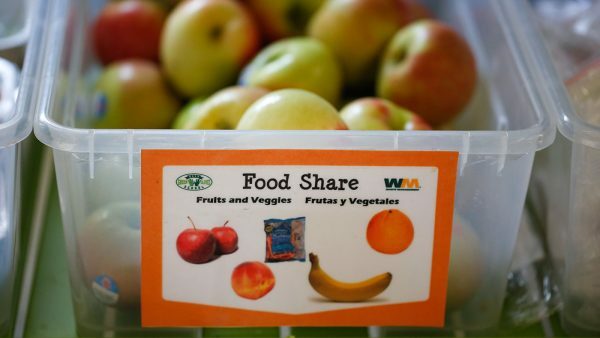 Since Deming can’t alter these requirements, she’s ensured that every school in her district has a food-waste safety net: the Food Share table, with signs in five languages. When the process — which the USDA now endorses — works well, it’s elegant. During a breakfast service at Piedmont Avenue Elementary, students can choose between a muffin and cheese stick combination and an Eggo mini-pancake package. When a boy interested only in a muffin drops his cheese stick on the sharing table, an attentive girl snags it within seconds. Deming has also established a “Take It & Go” initiative that allows students to bring unfinished fruit and packaged vegetables back to their classrooms — forbidden in many schools — and she’s working on a program that allows schools to share excess food with families in the school community. 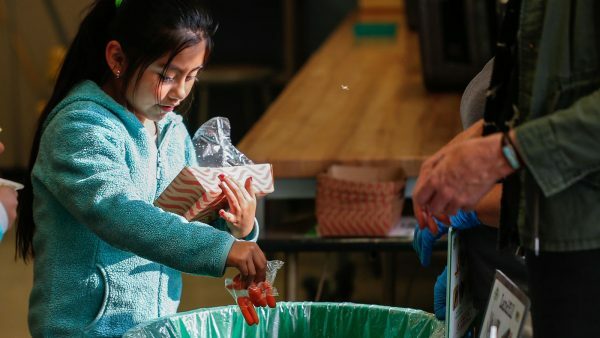 On Deming’s watch, share tables have expanded from a few schools to all 80 of Oakland Unified’s K-12 schools, and composting has more than tripled to serve two-thirds of them. Deming has become a sought-after speaker at food conferences, including this summer’s U.S. Food Waste Summit at Harvard University. Intent on helping other districts, she recently published a K-12 School Food Recovery Roadmap that guides school employees and volunteers through the often-convoluted waste-reduction process, including tips on fundraising, waste tracking, and engaging with staff. Deming, who grew up in San Diego, has always had a feel for the environment. She embraced composting while working at American Soil Products, based in the Bay Area, then ran her own sustainable gardening and edible landscaping company. When her daughter, who’s now 17, started at Sequoia Elementary in Oakland, Deming got involved with a playground renovation, then noted the school’s lack of composting and recycling and its ever-burning lights. After volunteering to work on school sustainability for a school year, she won a grant to tackle food-scrap composting. She worked as an independent contractor for four years, earning the trust of both the nutrition and custodial departments, before the school district named her its first-ever sustainability manager. The title matters. Deming says schools often waste food for the simple reason that fixing the problem is nobody’s priority. 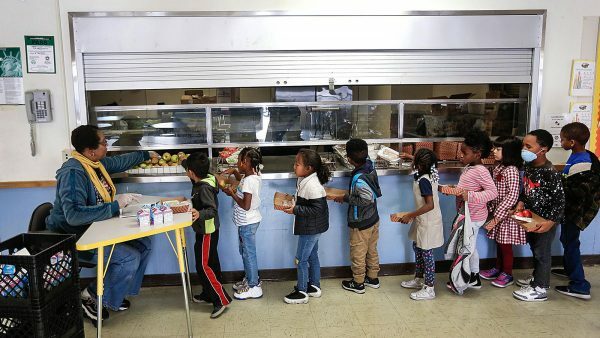 Hiring a sustainability manager requires resources, and Oakland Unified is especially strapped (this June, the district cut an afterschool dinner program that fed as many as 3,000 low-income students). That reality explains why Deming’s position is part-time, why she’s become an adept grant-writer, and why most of her salary comes from the district’s waste hauler, Waste Management. Even when schools are committed to waste reduction, they face bureaucratic and logistical challenges. When Deming first proposed share tables, the district’s Environmental Health Department raised food safety concerns. Deming quelled some with compromise. For example, she agreed to quit re-serving fruit with edible peels — apples, pears, plums — if a virus broke out. She created Food Share guidelines that spell out how to arrange food share bins; segregate hot and cool items; teach kids share-table rules; and clean up and re-serve or donate share items. To maintain food bound for redistribution, Deming recently won a CalRecycle Food Waste Prevention and Rescue Grant, which will pay for a refrigerated truck and additional refrigerators and freezers in the schools. She recalls other ripples of resistance. Like any manager, Deming needs numbers: how many items aren’t served, how many milks and apples are left on the share table? But the schools’ underpaid staff, working fixed hours, were hesitant to take on the extra task. To change their minds, Deming demonstrated and timed the task with a Nutrition staffer. After discovering it took a single minute, the staffers were converted. One out of five residents of Oakland’s Alameda County seeks help from the county’s community food bank, according to StopWaste, an agency that helps schools perform waste audits, increase their composting, and implement food sharing. Some two-thirds of those in need are children and seniors. Fully three-quarters of the district’s students receive free or reduced-price lunch. That someone collecting the food is John Holloway, who takes it to a homeless center called Berkeley Drop In, where Holloway works as a drug and alcohol counselor. Most days, Holloway drives his 2007 Pontiac Grand Prix sedan to Hoover and one other school to collect unserved wrapped entrees or those left on the share table. He also collects surplus school milk and fruit for the South Berkeley day shelter. Were it not for these fresh, varied, and nutrient-dense foods, the men would be stuck with a buffet of packaged bagels and muffins. Across the country, school trash cans full of edible food are the norm. Fewer than 5 percent of K-12 schools send food out to be composted. Only around 500 out of about 98,000 public schools have share tables — that’s half of 1 percent. And fewer still have active food donation programs, aided by national nonprofits like Food Rescue and Food Bus. What’s stopping the rest from donating? Inertia, mostly, and an unfounded fear of liability. TheUSDA reminded school food directors in 2012 that schools donating food are protected from liability under the Bill Emerson Good Samaritan Act. The response has been slow, as most districts lack a Deming. Back in Oakland, Deming is finding more ways to fight food waste. She’s encouraging schools to use their surplus food to help feed students’ families by relaunching a program called Food for Families. And she continues pushing schools to hold recess before lunch — a simple shift that improves appetites and keeps kids focused on eating. Still, Deming’s most potent weapon against waste may be her focus and pragmatism. After ensuring that the Hoover Elementary third grader’s plum would eventually be eaten by other students, Deming learns that Holloway is having car trouble, a bit of hard luck that would send much of that day’s surplus to be composted rather than donated. She pauses and sighs audibly, then quickly shifts her attention to the children approaching with leftover snacks to share and waste to sort. Produced in collaboration with the Food & Environment Reporting Network, a nonprofit news organization. This entry was posted in Environment, Global warming, Guest Post on December 2, 2018 by Jerri-Lynn Scofield. At least part of the problem is the unquestioned assumption that schoolchildren are mature and responsible enough to decide what they should eat. Imagine if that were the approach to coursework. Depends on the grade I suppose. I let my kindergartener (in Oakland as it happens) decide how much homework to do and such days he wants school lunch (based on the menu). It doesn’t go well every time, but I feel like kids need to practice making decisions in order to get good at it. Things will become less optional in later years, of course. But the article said they are NOT allowed to make their own choices. They are forced to take things they know they won’t eat. So ridiculous that the USDA “approves” this workaround program, to solve a problem they created in the first place… Due to their bureaucratic rules and regs. Also… I heard somewhere.. Secondhand from someone who knows an accountant that worked with school lunch programs IIRC…that corruption is rife in thise things. Even down to the level of the cafeteria managers. Somehow scamming the reimbursement system. Part of this is parental. When I was growing up in the 1970s, mother provided the food at family dinners and I would eat it, whether I thought I wanted liver or not. My friends were the same. Then I left North America as soon as I was able, so I’m out of touch. But last year, I was visiting a very old friend in Boston. Three children, and come dinner time, I was very surprised to see mom discussing/negotiating with the kids about what to eat. Yes, things have changed in this respect. With three children, a parent will now make three different dinners because of idiosyncracies among children. How did this happen? Although not directly related to the post, I think that a key to over consumption, would be Want Not, Waste Not. The problem is wanting too many things. If we all consume less we will damage the planet less. SO good to hear of schools actually teaching useful and important stuff. Learning by doing, every day, understanding why they are doing it, and what the consequences of not doing it are. Just flipping great. This is an important step in the learning process, and could lead her to the next step, that of asking why so many people are homeless when a few people have much, much more than they will ever need. But just the mention of fairness indicates she has a basic sense of justice… may she never lose it. My 91 year old mother no longer cooks and gets MoW. The food is generally quite unappetizing in both appearance and taste. It is amazing that they think elderly will drink milk every day. They even send chocolate milk. How many drink milk at all? Unfortunately when I visit, I often have to toss the better part of a week’s worth of these meals. She will eat maybe one in three MoW offerings. These depression and WW2 era people can’t bear to “waste”, so it just piles up until we toss. Sad. I cooked at the nursing home here for a while. there are regs that dictate salt and fat content, sugar subsititutes for the diabetics, etc…but the biggest deal is the budget handed down from the mothership. this ensures cheap and flavorless. My “customers” hated all the food that was served…until I discovered a well stocked spice rack behind some shelves that had apparently never been used.I also argued with the nutritionist about adding olive oil. it’s hard in an institutional setting, especially at the nexus of budget and lowest common denominator, one size fits all regs. In all the other kitchens I’ve worked in…out here, where I have a place…i’ve kept a bucket with a lid next to “The Line”. the “Chicken Bucket”. Health inspector invariably went nuts over this…and took a lot of patient work. as in the article, there’s lots of places in the web for individual action, and the numerous little points of failure…but given the hierarchical way we think we need to do everything, it’s difficult to dislodge the habits and unthought that inevitably grow up in the interstices. Our local hospital used to make their food in house. It was excellent, and while not organic, tasted great and met all the nutritional requirements. Then they outsourced to Sedexo Marriott Corporation that makes their money using the cheapest ingredients that they can get away with. It’s now corporate slop that is tasteless and presented in hard plastic containers that don’t keep it hot and in little dollops that look like hockey pucks. Most of it gets thrown away because it’s just horrible. Doesn’t matter, the corporation makes their money and the hospital saves money to pay the CEO a bonus. Given calcium, I would hope that they drank milk every day. Milk is not healthy for humans to consume once they become adults. This obsession with milk and the idea that it is some kind of health food is dangerous. One Australian hospital that I heard about privatised its food services. The contract specified porridge (oatmeal) as an option for breakfast, and sure enough, the porridge turned up on the breakfast tray. Cold. In a paper bowl. With a flimsy plastic spoon. The solution to this problem involved a (costly) contract variation. Ah, Sodexo. They have cornered the market on institutional food in Canada. It’s kind of uncanny how you can visit university cafeterias across the country and they all serve the same thing. Some of it is alright, but vastly overpriced for a captive market. I worked alongside a hospital catering service that fed staff, inpatients, and aged care residents. Staff meals were ‘health conscious’, with minimal fat and salt. Inpatient meals had reasonable amounts of fat (.usually butter) and salt. The elders’ meals had liberal doses of butter and salt, with more added just before serving. Now I am trying to figure out how to contact my local school board bureaucracy and elected representatives to “share” this article with them. Faceborg seems to be the only way in. And I’m guessing sending a small mail letter might just add to the landfill problem we have here. But maybe if enough of us jst take a few to pass this how-to along to the “deciders,” maybe dome good stuff would happen? Thanks for sharing that positive article. I get so tired/angry reading about the various antics of the bezos/zucks of the world. Finally someone ‘doing’ something, even on a small scale. Not noting the issue, or complaining about it – but doing something. Makes me consider what I could do. Maybe Elon could donate a car sitting in a lot somewhere to the guy with the broke 2004 GP. The U.S. produces a surplus of agricultural products so at a macro level this program is not “saving” a darned thing. It does not help the environment unless agricultural land is taken out of production and returned to the wild — which never happens in capitalism. Instead, “saving food” merely drives down prices and increases U.S. ag’s reliance on export markets. Ditto for people who are trying to help the environment by not eating beef — that’s just more beef that will be exported. If you want to help the environment then we need a Federal program to buy out farmers and ranchers and return the land to the wild. No real need to buy out ranchers, the economy of raising cows only really works in CAFO operations, I see so much former range that’s essentially already reverted back to nature. The number of cattle in the country is down to 1952 levels, and we’ve doubled our population since then. The state of VT was once largely deforested due to sheep farming and too much logging. The land my parents’ house sits on used to be dairy pasture land and is now 80 acres of woods. That is largely due to an unofficial Federal program that over the course of many decades favored large midwestern factory farms so they could scale up operations and grossly overproduce, and that put many of the small farmers out of business. There is plenty of farmland that has been reforested because I grew up on some of it, but it was at the expense of the livelihoods of the citizens who lived there. The only compensation many of them got was selling off their family property so it could become a weekend ‘farm’ for some rich person from the city to store their ponies. I get where you’re coming from and in theory it sounds great, but that isn’t what will happen in a capitalist system. If things are to change, it’s going to take the small farmers picking up their pitchforks and helping to put an end to capitalism itself. There are in fact several programs that do exactly this. The conservation reserve program, the conservation reserve enhancement program, the wetland reserve program, debt for nature, and others. These programs have taken several thousand acres out of production in my county alone. I think the experiences the children have are valuable, even though it is illusory on the grand scale. Sharing (communism) works locally, reduces waste, increases supplies to the needy and wanting, creates bonds both within the community and outside it, and often makes people happy. It is true it does not affect the great capitalist order because capitalism has power and operates on different principles. But change begins at the margins. There is (almost) no physical standard of living so high that, with a modest population and some degree of intelligence in the use of resources, it cannot be sustained. There is no physical standard of living so low that, if populations keep being forced upwards, the land will nonetheless be stripped bare and the rivers run with filth. At least until mass immigration changes things, Canada has a very high level of per-capita consumption: and the skies are clear and the water runs pure and there is plenty for all. India has very low levels of consumption – i.e., it is very EFFICIENT, it has VERY LITTLE WASTE – and the skies are polluted the rivers stink and the bulk of the population has a standard of living below that of late Medieval Europe. Bottom line: “Efficiency” is not the answer. It is at best a distraction. If we reduce our per-capita consumption of resources only so that the rich can jam in ever more people, we are not making the world a better place – well, except for the rich, who enjoy the profits of presiding over an ever larger herd. Great idea and implementation. Thanks for having it here. I agree that it should be shared with local school boards. You are not going to make the kids eat. At least get them to understand others could use what they don’t want. What this post touches on is that so much is possible when a change in mindset can set in. The conditioning that the American citizen has been subjected to is unprecedented in history. 24/7/365 the mind and social conditioning are geared toward outlandish consumption and the God given right to demand more. This effects all social classes. Every social institution has been transformed into a profit generating enterprise at every level. The actual reason for the institution to exist- its function- takes a back seat to profit generation. It is also revealing that the true leadership is coming from a engaged citizen, not a business leader selling change as a capitalist opportunity. What makes this post great, is that the potential to begin solving the social problems we all face requires a reversal of institutional priorities from Profit > Function to Function >Profit. We are racing toward a Profit=Function society which spells the end of the human race. Imaging what could be created if the bulk that human brainpower and effort can be channeled into a positive regenerative process instead of a dead, consumer oriented one. Add to that equation the support of a well functioning government and the possibilities really open up. This government support is in the form of providing resources so concerned and dedicated citizens like Nancy Deming can get on with making the world a better place. Not for the sole purpose of becoming “rich”, but to build a fair and well functioning society. What this story is about is the struggle over resource allocation and distribution- plain and simple. It begins to shatter the myth that the market is the primary framework upon which social institutions are constructed to deliver goods and services to the population. A market should be a secondary source, not the primary to deliver goods and services. True community partnerships are mutually beneficial and self-reinforcing. They evolve and strengthen over time. The two killing problems with capitalist thinking is how to deal with overproduction and that profit is generated at labors expense. So the solutions to pressing social problems can be found in finding effective ways to harness productive industrial technology and to once again view human labor as an important component of social institutions to be cherished and nurtured, not exploited and creatively eliminated at every possible turn. As pointed out on this site often, social inequality is the mark of a declining society- unhappy and plagued with stress. Just imagine a public school, providing food services to the students from a kitchen staff, working on site, using their human skills to lovingly provide nourishment twice a day. Local farms and food production services joining in partnership to make these relationships successful and lasting. This is where the real infrastructure program needs to begin, not building more bridges and roads to nowhere- which we will surely get from the profiteers currently running our government and working diligently trying to convince everyone that we live in the best possible world. Some will argue that these values of love should be restricted to the home and by contrast, the workplace and other social institutions are no place for this instruction to occur. But I would argue that the removal of love and responsibility from social institutions leads to the mess we see today. One cannot sever the connection between the home and the workplace- home and common social institutions. Such action leads to a mercenary and profiteering society. A society of rising inequality and despair- and ultimately to social destruction. This is a world of the rich against the poor. A world in which the rich stand apart from the poor. Public schools, public services, and religious institutions will be important forces in molding the patriotism embodied within the citizenry and will determine the future of the Nation. What form this patriotism takes is up for grabs. A bloody nationalism fearing outsiders or a peaceful patriotism focused on defense are both possible. The difference is if one supports peace or war. How people think and act begins at home, but must be reinforced and cultivated in the social institutions that propel the society. When these forces are at odds, the direction is uncertain and erratic. Focusing on these concrete steps to reverse waste begin at home, by the individual- but need to be faithfully carried out into the public sphere. There is an alternative. It just requires faith and courage to pursue that course- and different thinking. These are small steps that have great import. Norb- thank you for the time and effort you put into this well thought and phrased response. I agree with your points and like that you brought “patriotism” into it in the way you did. This should be an article with much ripple potential and a practice emulated in schools everywhere where Education is the mission. I went to such a school from 2nd grade through junior high. More than one of the cooks had a grandchild among the student body. The food was terrific — hearty and tasty. it was a shock to my system when I reached high school and “spaghetti” meant watery, sort of pink-ish noodles. To this day, I prefer spaghetti to be baked after adding the sauce to the noodles. And the Friday chili with cinnamon rolls for dessert! All made from scratch and totally to die for. Sadly, there was still a lot of waste as each child was required to take a serving of each item on the menu. Not nearly as much as the high school offerings produced, however. As for the rest of your comment, I whole-heartedly agree with Rob. When I was in prep school (think Hogwarts; class of ’65), there was a hall monitor who stood by the dishroom where you dropped off your lunch tray. You ate what was served – no brownbagging. If your plate was not empty, you had the choice of finishing the food or getting a demerit. Five demerits = detention (jug). The reason for the discipline was to instill awareness that all people do not have enough to eat. Often the food was terrible, tasteless, mystery meat, unattractive; the sort of food that poor people can afford. That simple policy was part of the curriculum to create a moral compass. It worked. There are no Trumps, Manaforts, Cohens, Stones, etc. in my class. When I was in kindergarten, we were required to bag lunch and bring a nickel for a carton of milk (shows you how long ago that was). I hated it. I sat there staring at it — sometimes for two hours — until it got warm and even yuckier, which was my only defense against being forced to drink it. Every day, on the hour bus ride home, while other kids laughed and played, I leaned my head against the cold glass to soothe my pounding head. Without the language to tell anyone that something was wrong, they never knew, and of course no one suspected back in those days that the “perfect food” for growing young bodies was a leading allergen. Teaching kids to eat healthy food is obviously important, not just for strong bodies but also for good mental health. But hard and fast rules such as you seem to be supporting can do lasting damage in other ways. I surmise that there are many ad hoc food waste programs in schools across the country. Granted, this is based on an empirical sample of one, and in a small school in a rural area of Upstate New York. But it can’t be the only one. My sister-in-law works at BOCES, maybe best described as an adjunct to NYS school districts, known mostly for offering instruction in trades. “Mary” (not her real name) noticed many years ago that kids were throwing away food and then getting off the bus at McDonald’s on their way home. There was nothing she could about the latter, but she and some coworkers did essentially what Deming did with untouched food, mostly fruits and vegetables. She didn’t tell me when they started, but it’s been years. She did tell me about the resistance she encountered and the inherent problems – pretty much what Deming describes in the article. Mary’s “program” doesn’t include donating leftover food, but the kids are allowed to take it home to their families. The composting element is simple: staff can take home inedible food waste to add to their own compost piles or to feed chickens, pigs, wild bunnies, etc. The recycling component, sadly, fell through. That her facility didn’t have recycling to start with was flabbergasting. She and her collaborators made a valiant attempt, but they didn’t have the time or resources to educate staff about what can and can’t be recycled. There also was the logistical problem of getting it to the closest recycling center. When programs are strictly voluntary, the same people end up doing the dirty work until they get tired of it. There’s no reason that a statewide system like BOCES couldn’t hire a Deming. Now that the absentee ballots are all counted (took until last week) and we have a new representative, this is a perfect time to send an email – with a link to NC, of course. This post reinforces Yves call for a wartime footing to combat climate change. The pace for change in each situation is different in urgency, but the fundamental principles are the same. Namely, that the Nations health and survival depend on addressing dysfunction and degradation as if we were being attacked by a foreign invader. How else to explain the rampant corporate pillaging and social maleficence under way? A way must be found to hold accountable corporate wrongdoing in relation to social decency. This should be the function of law, but doesn’t seem to work over the long haul. Laws must be properly enforced or written in the first place to ensure public safety. Predators must not be able to circumvent the law or destroy the spirt of social cooperation. As an anecdotal story, over the holiday, a relative of mine who works at a local food bank in southern Illinois shared a story about how they had to tell Wall Mart not to send any more food donations. Wall Mart was repeatedly sending way too much food than the agreed amount, or the majority of food was too spoiled upon arrival, necessitating hours of work by the volunteer staff to sort and discard- it was wasn’t worth the effort. The cynic in me imagined Wall Mart’s public relations campaign to portray itself as a socially responsible partner, charitably donating food to the poor- but in reality aggressively pursuing a capitalist strategy of cost shifting. Good PR at low cost, externalize disposal costs, and pursue tax write-offs. If pressed, they would surely argue that it is not their responsibility- or mission- to see that people don’t starve to death. But that is the problem in a nutshell, someone needs to take responsibility. The true narrative is that Wall Mart did not pursue a workable and functioning system to deal with food waste or misallocation. The local community needs food and people go hungry if they cannot afford to pay for it. It would be interesting to see the amount of tax write-offs corporations take for their charitable contributions and the actual results of the activity. I would guess it would be more rational to give money directly to people in need, but that is another story. Another part of the story was the most successful and sought after donation was by a local egg farmer. He regularly donated hundreds of dozens of fresh eggs and did not take the tax credit forms. He did it out of moral obligation to his fellow citizens- and remained anonymous to the public at large. A wartime mentality would move decision making back to government planners and egregious profiteering would not be tolerated. The systems put in place would be geared toward positive results, not profit gained. However, conversations about National survival and priorities are difficult to have when everything is tainted with the drive for profit. Such a Government must be concerned about the citizenry, not protecting an elite. There seems to be a need to come to an understanding of what sectors of the economy should be off-limits to speculation and profit taking. Government policy can then be rational and effective. What is good for unfettered private enterprise is no longer good for the rest of us. There must be a baseline of acceptable behavior that everyone agrees upon and works toward promoting and cultivating. It is not voluntary, but the accepted norm to be considered part of the community. Recess before lunch! What a good idea! Not every community has access to the local produce, like this one that does. Our granddaughter eats everything on her school lunch plate and has developed taste buds that can tell the difference between organic and non organic chicken for example. Excellent initiative, makes me jealous it happens somewhere. Note however that something clearly useful and relatively straightforward as school lunches is not a simple thing to administer. The rules that are meant to prevent one kind of misuse end up creating unintended consequences (see also the comments). Imagine running a job guarantee program. Teaching kids they should eat if they do not want to is a fine way to avoid the obesity challenge. This is critically needed work, and with Deming the only school employee in the country tasked with fighting food waste, it seems a job guarantee could fill a gaping void here. Moreover, the value of this activity is that the tactics used to address the immediate ills of waste/ pollution, hunger and ecological decline have the potential to mitigate these problems in the future. That’s because the kids in that cafeteria are learning what it means to have agency–as persons, as members of public institutions, and as citizens of the world at large. They are allowed [some will clutch-pearls here] to express preferences and are provided a simple way to negotiate them. They are demonstrating a wider awareness of the social consequences of misallocation of resources (unfairness). Might they be curious about the causes of such injustice? The same goes for lessons in ecology; composting is a direct way for children to learn that they are producers as well as consumers, and that it’s worth thinking about the ‘what’ in both scenarios. One hopes these students will be better prepared to navigate life than those who’ve been effectively “skilled and drilled” into swallowing, unflinchingly, whatever has been handed them. I’m so glad the great work at Hoover Elementary getting coverage, much love to Jerri-Lynn Scofield. on the other side of Oakland in Fruitvale Cristo Rey de la Salle HS opens its campus and facilities and helps out East Oakland Collective’s Feed the Hood. funded entirely by locals and local businesses and staffed by volunteers EoC/CRdlSHS puts together 3K lunches and hygiene kits to the homeless, delivered in caravans with care and respect. There is a lot of this type of grassroots activity going on here, planting seeds which hopefully will take root. Another great post by NC combined with a good discussion. As an Oaklander who was born, educated, labored and involved in California politics for several decades, this story reflects a larger history of community-based activists working across the state. These stories are not unique to California, but have common ground with many other communities across the nation. These are stories not only encouraging as pragmatic solutions to the contradictions of everyday life (poverty amidst plenty), but crucial to devising a larger political strategy grounded in the good works of so many otherwise invisible activists.